The Victorian Race Walking Club is a specialist racewalking club which has been affiliated with Athletics Victoria since 1921. The club is also affiliated with the Australian Federation of Race Walking Clubs (now known as 'Racewalking Australia'). The famous flying foot logo has uniquely identified the club since its inception. Club races are conducted all year around in a traffic free environment on the Albert Park Formula One Grand Prix service roads Albert Park Reserve, Middle Park. The clubrooms are in the Middle Park Bowling Club which is shown in the following map. All club races are conducted in accordance with the rules and regulations of the International Association of Athletics Federations. However, walkers participating in club races can also walk under 'Club Rules' which offer a more relaxed interpretation of walking, suited to beginners or older walkers. Our winter season sees us racing at Middle Park every weekend (mostly on Saturday afternoons but with a few Sunday mornings thrown in) from late April to mid September. Note that our races are open to anyone - they are not age group delineated. Regardless of which event you enter, will will automatically receive Handicap and Actual Time points in your correct division - U10, U12, U14, U18, Open, Masters (40-59) or Masters (60+). The club assists Athletics Victoria to conduct the Victorian Road Walking Championships. The club also assists Athletics Victoria to conduct the Athletics Australia Road Walking Championships when they are allocated to Melbourne. As well as conducting club events for masters walkers, the club assists in the conduct of the road walking championship events for the Masters Athletic Associations when the events are held in Melbourne. The club also boasts a weekly very comprehensive email based newsletter ('Heel and Toe Online'). Specialised coaching in racewalking technique can be arranged for all levels from beginner to advanced. Seminars are conducted regularly by Athletics Victoria qualified club coaches. in every Australian Olympic Team since World War 2.
in all but one of the Australian Commonwealth Games Teams since walking events were introduced into the Games at Kingston, Jamaica 1966.
in all IAAF World Race Walking Cup Australian Teams since the IAAF introduced the competition in 1979 at Eschborn, Germany. 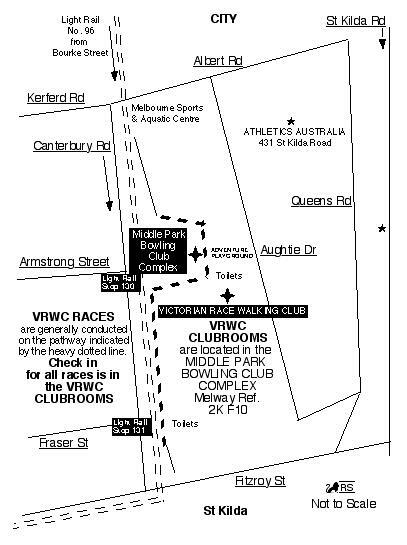 VRWC is proud to support Runners World Melbourne which is a club sponsor. We recommend this store for all shoes and related sporting gear.